•… provide information on the causes of flight: « Those who sow the weapons, will reap refugeess ». We are open to all those who – no matter what time commitment and focuses – like to get involved with us in this area! We try not only to clarify the legal situation, but also to offer practical help: through accompanied visits to authorities, correspondence with public authorities, or - in particularly serious cases – writing a petition to the Hessian Parliament. Our advice service is being used by refugees intensively and frequently. We strive to inform the broad public about the legal situation and living conditions of refugees, to provide information on reasons for flight and to overcome prejudices. Therefore we operate information booths on various occasions, organise own events and join those of other related groups. We also try to give voice to the concerns of the refugees in the media (press and radio). Above all, we are glad to work with schools and to throw light on causes of flight and the circumstances of refugees in Germany or to discuss it! Under public relations as a "political work" in the narrower sense we understand the attempt of influencing the prevailing politics. We organize and participate in demonstrations, rallies or pickets and collect signatures (e.g. for a stop to deportations in a given country). We also participate in nationwide campaigns and strive for closely cooperations with other organizations such as Pro Asyl and Amnesty International on both local as well as on inter-regional level. We are member of the Refugee Council of Hesse (Hessischen Flüchtlingsrat ), the Coalition "Rhine-Main against deportations" (Aktionsbündnis Rhein-Main gegen Abschiebungen ) and "No human is illegal"("Kein Mensch ist illegal"). Furthermore, we are trying in particular to cooperate with groups and individuals in Wiesabden to whom the issue of refugees is important. The Refugee Council Wiesbaden is ally of the Wiesbaden alliance against fascism (Bündnis gegen Rechts). The aim of this alliance is to act on a broad base against the activities of Neo-Nazis, to oppose deployments and rallies with extreme right-wing, racist and anti-Semitic character. As far as time allows we visit refugees in their quarters to give them informations about the Refugee Council and to inform us about their living conditions there. We want to draw attention to at least the worst problems and try to correct them. With relief, we have taken note that the accommodation in the former Rotaprintgebäude in 2007 was finally closed. Given the catastrophic constructional conditions it was a long overdue decision, which was not least dued to many visits by city councillors in the accommodation and inquiries in the city council. Certainly the most unpleasant form of an "accommodation" is in the custody pending deportation. We take care of the in Wiesbaden detained, juvenile and adolescent detainees (adults are not accommodated in the Wiesbaden prison). If possible we try to establish contact with their families and to lawyers and strive to achieve a release from prison. Above all we do our best to give the young people the feeling of not being alone in this situation. An increasing number of detainees arrested in Wiesbaden is due to the so-called "Dublin II Regulation", with the aim to redeporte them to another EU state. The "Dublin II"- treaty is a jurisdictional settlement for asylum procedures in the EU. The jurisdiction of a country - regardless of the reasons for the flight – is usually determined on where a refugee has entered the EU the first time. This system has lead to a situation in which those seeking protection are being shoved back and forth among the EU states, facing weeks or months in detention before being deported again. Particularly problematic is the situation for Iraqi refugees who have entered through Greece, since Greece does not guarantee a constitutional asylum process and there is a danger of a chain deportation to Iraq. For our legal aid funds we ask for earmarked donations which we use to help destitute refugees (and those are the most! ), to allow them to occupy a capable legal representation. With funds from the legal assistance fund, we are able to call in lawyers to lodge the appeal process in the most extreme cases,. This primarily concerns deportation detainees. This intervention is very effective: in the period from October 2006 until December 2007 assistance from the Fund of the Refugee Council Wiesbaden was granted in seven cases to support adolescents who sat in the JVA (juvenile detention center) Wiesbaden under arrest. In six cases a releaase has been achieved through legal recourse. Only one young man was deported to Iran. In addition, the mutual funds helps to finance psychological and medical reports for traumatized persons. The reports have repeatedly led the administrative courts to decide against a deportation of traumatized people. For many years we work closely with lawyers specialized in asylum and immigration law. We meet regularly with lawyers in Wiesbaden and persons engaged in the field of refugee work. In our office we meet to exchange experiences and to train and improve our skills. • takes place once a month on the 2nd Monday of the month at 18 oclock in our office Blücherstraße 3. • is a place to exchange informations, to report on on the work of the past month and to plan the coming activities. Without having the character of a public event, it is still open to proposals and, of course, the critism of everyone who is intersted. The association was founded in 1993 to ensure the work of the Refugee Council financially and to be able to make legal transactions such as the rental of the office. It is recognized as charitable, so donations are tax-deductible. Without regular donations our work would not be possible. The general meeting of the members of the Friends of Refugees Wiesbaden is hold at least once a year and elects a board that manages the business of the association and the budget, plans and conducts fund-raising actions or proposes them to the plenary assembly. The collaboration is possible both continuously as well as project-related! If you are interested just come around to our next plenum. You can become a member of the Friends of Refugees Wiesbaden or support our work through individual donations. If you give us your address details, we can also send you a receipt for the donated amount. to improve the lives of refugees in Germany. Take the bus line 14 from central station (direction Klarenthal). Get off at "Gneisenaustraße". The office of the Refugee Council is located on the opposite side of the street. 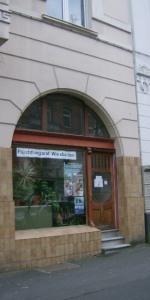 In case of links to other sites, directly or indirectly, the Flüchtlingsrat Wiesbaden e.V. can not assume liability for their content and design, since it has no influence on it. If these linked webpages have illegal content or infringe the rights of third parties, the Flüchtlingsrat Wiesbaden e.V. dissociates itself from these pages.